BERLIN -- Samsung Electronics announced the global launch of its first 8K (7680X4320) quantum-dot light-emitting diode TV on Thursday, the day before the opening of the IFA 2018. 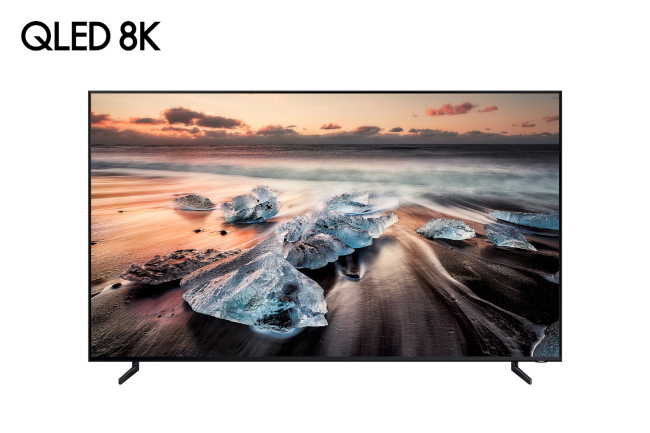 Dubbed Q900R QLED 8K, the lineup consists of large sizes of 65-, 75- and 85-inch models. It features clearer and brighter picture quality than the current 4K (3840×2160) TVs as it uses a quadrupled number of pixels. Due to the higher pixel density, 8K TVs provide a more immersive experience for viewers with more live content. Samsung is emphasizing the importance of picture quality -- accuracy, color volume and brightness -- as the premium TV market is trending toward large-size screens. According to IHS Markit, the market for large-size TVs of over 75 inches is estimated to grow from shipments of 2 million units this year to over 5 million by 2022. Samsung has used the industry’s first artificial intelligence solution to upscale content of any quality to 8K resolution, which automatically adjusts brightness, blackness and subtle details in lines and colors. The solution runs on a machine learning algorithm that was made out of a vast database of millions of scenes analyzed. The AI upscaling technology also controls sound, for example, by raising the background sound volume for sports games. “At Samsung, we’ve worked tirelessly over the years to move the industry forward when it comes to premium picture quality, and the introduction of our QLED 8K with 8K AI Upscaling is an integral component as we look to the future of displays,” said Chu Jong-suk, senior vice president of the visual display business at Samsung Electronics. Samsung’s rival LG Electronics on Wednesday unveiled its 8K organic light-emitting diode TVs, saying that the large-size TV market will continue to be led by OLED TVs that are self-emissive, unlike QLED TVs that require the liquid-crystal display’s backlighting.